When thinking about perfect weekend getaway where at the same time you can be active while walking or cycling through an untouched and colorful nature, breathe fresh mountain air, enjoy in crystal clear waters, feel a charm of medieval times, taste delicious local cuisine together with a hospitality of local people and at the end feel the serenity we are all looking for, trip to Bled will fulfil all your wishes. Upon our arrival to Bled, and after the check in to our hotel Ribno we went down to the Lake and were immediately impressed by the beauty of the nature. Lake and mountains were bathed with the sun and surrounded with a colorful autumn atmosphere. 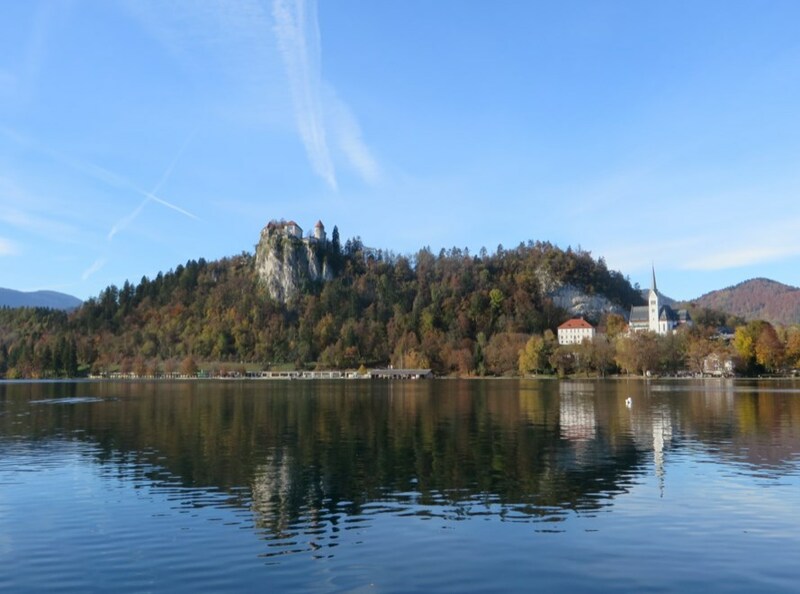 As we heard there is saying which says that you haven’t really visited Bled if you haven’t taken a trip with the Pletna boat, we hop in it and let the oarsman take us on a tour of the lake. As there were not so many people at the time we wanted to take the Pletna boat, we needed to wait around half an hour for other people to join. I believe that during the summer season the reason for waiting could be that too many people at the same time would like to go for a ride. The ride lasts for around 15 minutes, and as soon as you arrive to the island, you will get 40 minutes to spend at the island. There is a possibility to enter to the Church of the Assumption and to climb on the Tower, and to take a short walk around the island. To get to the church there is a climb up the 99 stone-step staircases, and tradition still is that the groom should carry his bride up all of the 99 steps in order to get married in the island church. We didn’t witness the wedding ceremony, but only a wedding photo session, and were lucky to enjoy in a part of local traditions. On our way back from the island we smoothly glide over the lake and felt the serenity overtaking us as our oarsman rowed back. Before we continued the walk around the whole lake, we got the recommendation from local people to eat at restaurant Murka serving traditional food. Food was tasty, portions were quite big, the atmosphere was authentic, and the service was very lovely and welcoming. To enjoy some more time in relaxation and in a recreation we took a 6 km trail around the lake, and ended our first day in Bled. After a great night sleep we were ready for our next active day, and decided to visit the heart of the Triglav National Park, Bohinj. It is only 20 km from Bled, and easy reachable by car, but it is more advisable to arrive by train or bus due to the environment protection, and use bike or bus to move around. Our first stop was third most visited attraction in Slovenia, Waterfall Savica – a spectacular waterfall in the middle of steep walls of the Komarča. It takes around 20 minutes walking till you reach the nature phenomena. If you prefer to avoid a crowd, it is advisable to visit Savica Waterfall as soon as possible in the morning. On our way back we stopped at Ribičev Laz and went for a walk next to the lake Bohinj. The lake is the largest natural lake in Slovenia, and lies in the heart of the Julian Alps. Lake is 4.2 kilometers long, one kilometer wide, and forty-five meters deep, and offers endless possibilities for outdoor activities. During the summer time here you can swim, ride a boat, wind surf, do kayaking or canoeing, go fishing and diving. As we visited Bohinj during autumn month of October, our choice was a relaxing walk along the shore followed again by a delicious lunch in an amazing surrounding of restaurant Pri Hrvatu in a village Srednja vas, only a couple minutes driving from Bohinj Lake. If you find yourself at Bohinj with bike, exploring local villages is highly recommended. Only 4 km from the center of Bled, there is another natural attraction not to be missed as it leaves an impression on every visitor, The Vintgar Gorge. During the half an hour walk in one way trails, narrow passages and bridges lead us to the end of the gorge while enjoying in the roar of the river Radovna full of small waterfalls and rapids. Its steep slopes overgrown with beech forests together with the mighty river, made us feel like in a fairytale. The Vintgar gorge also includes two man-made sights - the single-arch stone bridge of the Bohinj railway, constructed in 1906 which crosses the gorge 33.5 m above the trail, and the dam at the end of the gorge from which the water is routed to the small Vintgar hydroelectric power plant under the Šum waterfall. “The Slavic girl lay here for hundreds of years, one dark night she rose from her grave in tears. Ghosts must have stolen all of her bones, HELP US RETURN THEM TO THE GIRL WHO MOANS! Legs and arms, body and head, wow, this party will surely be mad. In corners and cellars hidden and black, your laughter will die and never come back!” – With those words Bled Castle invited its visitors to step into the adventure of the popular Halloween this year, and on our last day at Bled we climbed all the way to the Castle to feel the spirit of medieval times and of the Halloween event. Apart from the castle’s attractions as museum, printing works, forge, chapel or wine cellar all around the castle we found knights, witches and different creatures sending the message of past times and customs. Morning time was reserved for children’s program, and during the night you could enjoy in spooky Halloween. As we had to come back to Zagreb in the late afternoon, we only had the opportunity to spend our time in the castle during the day. One of the “activities” in the castle where I took part was a demonstration of bottling of wine from oak barrels in wine cellar – I filled a bottle as a souvenir, corked it and waxed it, and at the end got a certificate for all hard work. All in all, the visit to the castle put a nice final touch to our 3 day trip to Bled, and while enjoying in the last view on the lake for this time, we knew that we will come back to enjoy in some more activities, and visit some more nearby places. Hotel Ribno is situated at the end of a small village Ribno, what makes it perfect for all of those looking for a completely peaceful stay in touch with nature, and is around 5 km away from the Slovenian Alpine pearl of Lake Bled. Hotel is surrounded with forest and a river Sava is just steps away from the hotel..
We were told that due to the cold weather they do not rent bicycles any more for this season, but it seems from my point of view very convenient to have a bike and explore the nearby area. Hotel also offers a glamping accommodation, which from the outside looks absolutely stunning. Houses are located in the forest just next to the hotel, and each of the houses has its own terrace with a wooden hot tub. As all houses were occupied during our stay, we were not able to have a sneak peek into it, but from the outside they seem very cozy, and tempting for the next summer holidays. Bled is a destination recommended for: all types of travelers – families, couples, those looking for a relaxation, sport and outdoor activities; nature lovers. If you are living nearby as we do, it will be most convenient for you to arrive on your own by a car, but if you are an international visitor and might be staying in Ljubljana, you might consider taking a private or a shared sightseeing day tour. For more weekend ideas in Slovenia, have a look at wellness sport and holiday portal Relaxino.com.